THE PERFECT MIX OF COMPETENCE AND PASSION TO MAKE YOUR BUSINESS TAKE OFF. YOCABÈ was founded in 2015 by former managers of Expedia and Venere with the aim of revolutionizing the fashion industry inspired by the success of the Online Travel Agency (Expedia, Venere, Booking, etc.) that have allowed large and small hotels to reach customers in every part of the world without having to face the huge investments in technologies, processes and skills essential to succeed online. YOCABÈ is the ideal partner for the online distribution of fashion products, thanks to its network of shops on the main international marketplaces (Amazon, eBay, Spartoo, Privalia, Zalando, OTTO, etc.) through which to reach the millions of customers who, already loyal at the marketplace, make regular purchases. In just over a year, YOCABÈ has already contributed to the growth of sales of brand partners, both large and small, bringing new customers both through Amazon, Ebay, Privalia, etc. and through their own portals in Italy, Germany, France, United Kingdom, Spain. We distribute brands all over the world, giving people the opportunity to purchase the products they are looking for on their trusted marketplaces and giving companies the opportunity to reach more than 100 million customers. 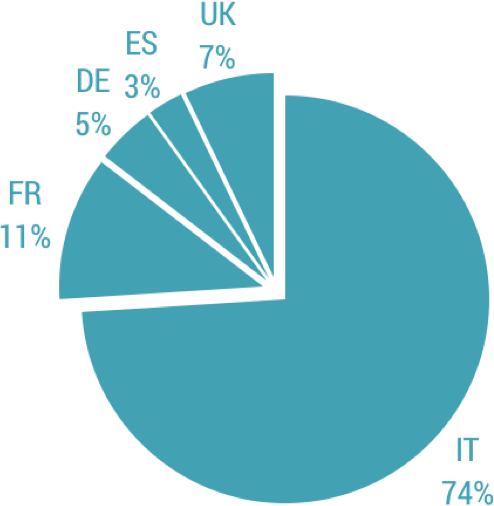 During the last year, starting from Italy, we have extended sales for our partners to the five main European markets. Germany, France, United Kingdom and Spain represent for YOCABÈ platform rapidly expanding markets with enormous potential. We work daily to optimize sales of our partners’ products in each country, based on the characteristics of different markets and the purchasing habits of people in different countries. Come and visit us at our operative head quarters in Via Nepal 5 in Rome, EUR area, at Pi Campus.